Hi, Good Morning. Thank you, friends and viewers. 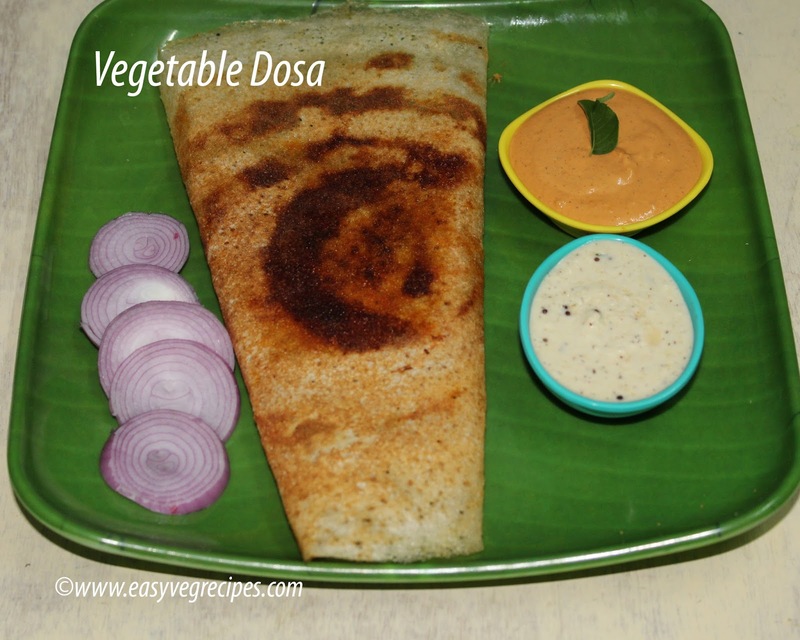 Today I will post how to make vegetable dosa recipe. The Taj Mahal Hotel in Abids, Hyderabad is very old and famous. They have some signature dishes. They are maintaining the taste for ages. I first visited the hotel in my childhood and had dosa and idli. After almost 25 years of gap again in last December, we had been to there. Even after so long gap, I could recollect all those tastes, because of their maintenance. They have opened another outlet in the upmarket area of the city, i.e. Jubilee Hills area. Last month we had been to there, this time Saye offered me to have Vegetable Dosa. I can simply say the taste was awesome. I still drool when I remember the taste of it. I wanted to give it a try at home, but a bit hesitant of the taste. I don't know whether I can get the rich taste or not and also don't know whether it is liked by others or not. With so many doubts in my mind and so much of hesitation, I tried this dosa last Saturday. I tried it at home as much as I could remember the taste of the restaurant dosa. To my surprise, it was all success. The taste was just the same as the restaurant one. My lovely hubby recorded all my activity. It was not planned, so the video is not so clear and clean. For now, please bear with us. Next time when I prepare again, we will record it with clean surroundings and full clarity in the picture. Chop all the veggies into small pieces. In a blender jar add all the ingredients given under 'Ingredients for Masala', ground it to a fine paste. Heat oil in a kadai, add ginger garlic paste. Fry for a while. Add chopped onions, fry till the onions become translucent. Add the ground paste and fry it till the masala turns light brown. Add all other chopped vegetables and mix well. Add turmeric powder, salt and red chilli powder. Add peas also and mix it well. Sprinkle little water and cover it. Allow the veggies to become soft and let them cook for five minutes. Soak tamarind for five minutes and squeeze out the juice. Add the tamarind juice to the curry. Let it cook for five more minutes. The courry should be neither too loose nor too thick. Little moisture should be there in the curry. Keep the curry aside. Heat the dosa tawa, sprinkle little water to check the heat. Pour a ladle of batter and spread it on the tawa. Once it is cooked on one side, flip it and cook the other side also. Flip again and spread a spoonful of curry over it. Serve Vegetable dosa with any spicy chutney like peanut chutney or coconut chutney. Thank you for visiting my blog. Hope you liked all my recipes. Any feedback and comments are appreciated. For more breakfast recipes click here.